The Fed has “raised interest rates” (wink-wink). Its primary tools in this make believe policy are interest on excess reserves (IOER) and the interest paid on reverse repos (RRP). The new Fed Funs target rate is now 25-50 bp. 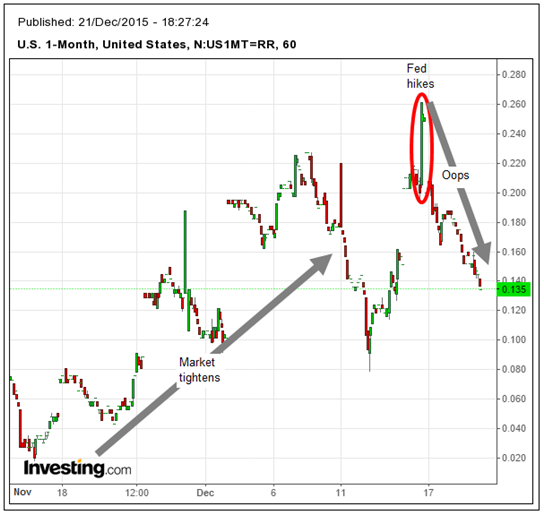 Fed Funs were reported to be trading at a weighted average rate of 36 bp on December 22. Of course, there is no actual Fed Funds market. Fed Funds are the money that banks who were short of reserves borrowed from banks which had excess reserves, so that they could meet the minimum reserve requirement. In 2008, the amount of Fed Funds outstanding rose as high as $450 billion. Over the past 7 years, as the Fed pumped $2.6 trillion of excess reserves into the system, virtually no banks have been short of reserves, so the amount of Fed Funds outstanding shrank to $50 billion. Today there are very few banks which need to borrow reserves to meet their requirement, and those that do are certainly not representative of the market as a whole. These would be banks in distress, or banks who are acting at the behest of the Fed to make it appear that a real market exists. But in reality, banks that need to borrow Fed Funds today are more like people who are so short of cash that they are forced to resort to payday lenders to pay their bills. The Fed Funds rate is therefore the equivalent of the payday lender loan shark rate for banks who are so short of cash, they can’t pay their bills. In order to make it appear that the it actually has control over short term rates, the Fed has increased IOER by 25 basis points. This increases the subsidy the US taxpayers are paying the big banks from $6.5 billion per year to $13 billion per year. But hey. We don’t mind. It’s for a good cause. And it’s only $40 per American. We’re happy to help out. Somehow, the Fed expects that by having us pay the banks more income the banks will raise the interest rates that they charge their customers and that this will gradually cause the money markets to tighten. Or to put it differently, that by lowering the banks’ cost of funds, that will somehow make them want to charge even more to lend money to their customers. Think about it. You are a bank and your costs go down. What are you going to do to put more loans on the street and maintain or grow your market share? Raise the price to borrowers? I think not. 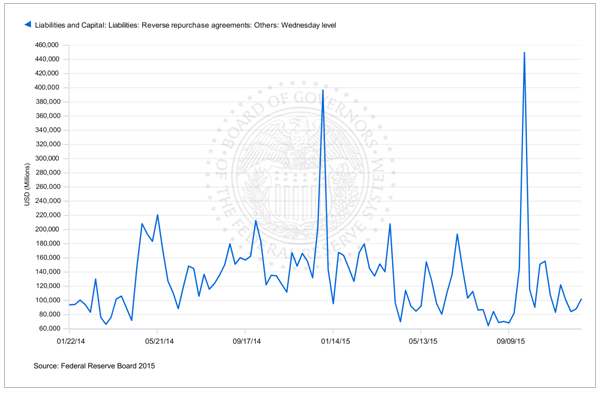 Another tool the Fed is pretending will have an effect is the daily overnight reverse repo operations. While the typical daily operations of $100-150 billion are small relative to excess reserves, the Fed also expects that by paying the banks more to switch their deposits at the Fed from regular reserve deposit accounts to overnight RRP accounts that this will somehow reduce the amount of cash and lendable funds in the system. The Fed is attempting to compound the illusion by augmenting the overnight operations with quarter end window dressing term operations lasting a week or two. At the end of the third quarter outstanding term repos briefly soared to $440 billion as the banks and money market funds opted to show that they were holding repos from the Fed on their books at the end of the quarter. That isn’t merely tantamount to fraud, it is fraud. Those term RRPs existed purely for the purpose of window dressing. They come for a few days at the end of the quarter and then they’re gone. The question is, “Who’s kidding whom?” The Fed isn’t fooling anyone except itself. To borrow a phrase from Blazing Saddles, the Fed is just jerking off. $178 billion of overnight RRPs were outstanding at a rate of 25 bp on December 23. Amounts outstanding over the past week ranged from $102 billion to $186 billion which is just a little higher than in the weeks before the rate increase. Meanwhile there have been two quarter end term repo operations. Guess what. No takers. None. Zero zilch nada. Hey Janet! What up wid dat? The banks don’t need reserves to make loans, so these games the Fed is playing will have no effect whatsoever on bank lending. This whole sham show is insane, but for this week at least, some parts of the market are acting out as if they believe the Fed. In the first week after the increase, the commercial paper market rates rose. The rate on overnight AA financial company paper was 30 bp, which was only 6 bp below the sham Fed Funds rate. 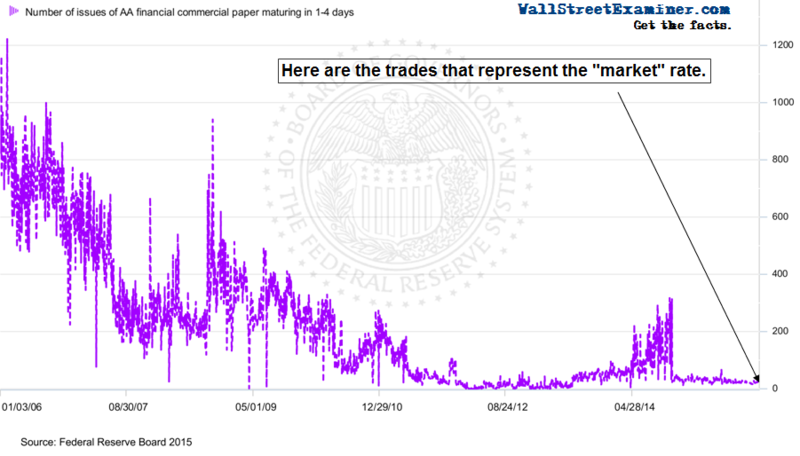 But are the commercial paper rates any more a true representation of the market than the Fed Funds rate? The overnight AA financial company rate was based on 27 reported trades. Not 27 hundred trades. 27 trades total. That’s only 98% less than the 800 to 1,200 daily trades typically reported before the financial crisis. As nonbank financial institutions lost trust in one another in 2007, that number declined to around 200-300 per day. 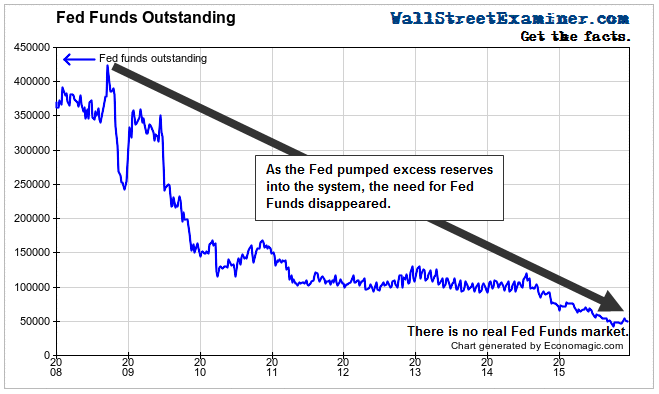 Then once the Fed began to pump excess reserves into the system the market dried up completely. The rates reported in the short term money markets are meaningless because there is no short term money market. The system is so awash in funds that the advice of Shakespeare’s Polonius the fool, “Neither borrower nor lender be,” is a perfect fit for the scene. The T-bill market is still active, and the results there show that the Fed really has less control than they pretend to have. 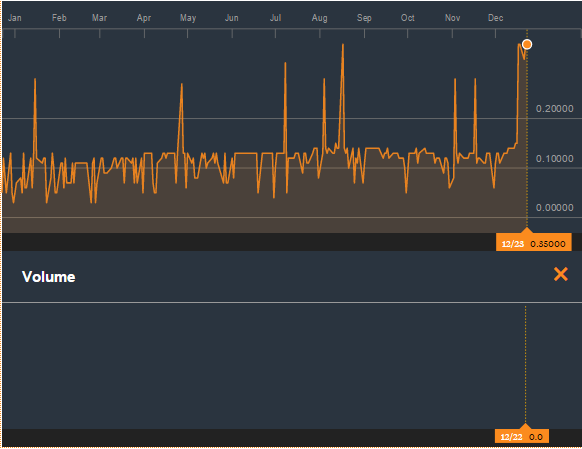 The 4 week T-bill hit 26 bp on the day the Fed announced the rate increase. That was hardly an increase. They were trading at 22 bp 2 weeks before. Then after the “rate hike” the 4 week bill traded down to a rate of 13 bp on December 21. It was back to 19 bp on Wednesday December 23. The 13 week bill rate hit 31 bp after the announcement and is now back t0 20 bp. These are clear signs that the Fed does not control money rates where real markets exist. Finally, let’s take another look at that Fed Funds rate. Wouldn’t you be curious to know the actual volume of Fed Funds trading that establishes this rate that is supposedly so important to the market. Yeah, right. Me too. So I went looking for it. That’s right. It doesn’t exist. You don’t believe me? You know that Bloomberg has a stat on every investment and economic instrument know to mankind right? Here’s how Bloomberg’s chart of Fed Funds looks. The Fed Funds rate reported by Bloomberg includes a trading volume of zero. That’s not just today. It’s every day. If there are real Fed Funds trades, nobody has any idea how many trades there are, how large they are, and even whether they represent unrelated counterparties. Wall Street and the media simply accept on faith that the reported number is based on real trades using real money, between arm’s length counterparties. But the Fed makes no data public to support that. The bottom line is that we have no idea what the reported Fed Funds rate actually represents. Is it real? Or is it Fed-o-rex?